I'm the only one watching. lay in fear--a shivering glare. after the asteroid hit Yucatan. of empathy, in order to carry him forward. Copyright 2008, Timothy Houghton. © This work is protected under the U.S. copyright laws. It may not be reproduced, reprinted, reused, or altered without the expressed written permission of the author. 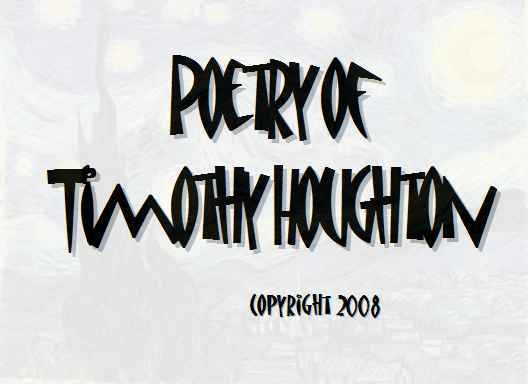 Timothy Houghton's latest book of poems is Drop Light (2005, Orchises), and he worked on poems for that book at The MacDowell Colony and Hawthornden Castle International Retreat. Relatively recent reviews of DL appeared in The Literary Review and Chelsea. Poems have recently been published in such magazines as Chelsea and Stand Magazine. He lives in Baltimore where he teaches at Loyola University. He also leads local birding hikes for Audubon.